We are an organisation founded by ex-offenders to serve ex-offenders. We operate on the love and goodwill of the many ex-offenders who freely share their testimonies (though we try to pay travel expenses). We have uploaded many life stories of people who’ve spent time on the wrong side of the law and the world, but have tested and found true the promises of new life in a middle eastern carpenter who lived and died and lived two millennium ago – the one and only Jesus Christ. The reason we’ve done this is that you might draw hope for yourself, and come to know the same man at work in your life as your unconditional friend, higher power and brother born for trouble. We have also uploaded some victims life stories too, in the interests of restorative justice, to help folk appreciate and feel the pain caused by crime. This is not to overlook the fact that a majority of criminals were first victims of crime long before they ever committed a crime themselves. Below is a picture from our historic first meeting, October 7th, 2006. 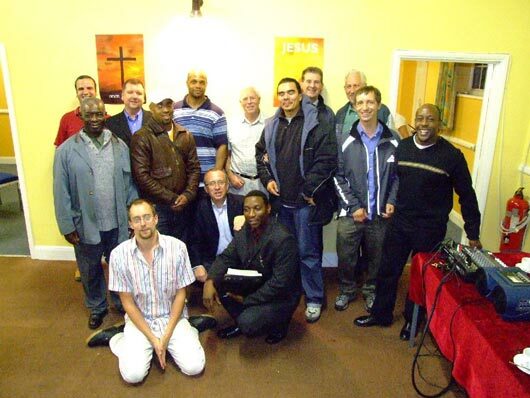 Third in from the left (standing) is our founder Frank Brookes, who has now gone to be with the Lord he followed for over 30 years.